This season the Shockers will tip 30 minutes earlier on weeknights and select weekend games. Contests will now start at 6:30 p.m. instead of 7 p.m. like in seasons past. The Shocks first 4 games are all at home and all against weaker teams or teams that are also rebuilding. Arkansas Pine-Bluff is up 1st on Wednesday, November 7th, with the opening tip at 6:30 pm. Arkansas-Pine Bluff was 6-21 last year with all 6 wins in the SWAC and 3 of their top 4 scorers from that team were seniors last year. They are picked to finish 9th in the SWAC this year and had an RPI of 331 last year. Missouri State on Saturday, November 10th, at 2:00 pm would normally be a challenging opponent but they are somewhat in the same shape as the Shocks in terms of yourth and inexperience. The have only 1 senior and 2 juniors on their roster with 6 sophomores and 5 freshman. So they aren't quite as young as the Shocks but they are pretty young. 6-2 Jr. guard Alexa Willard is a very good player and a tough match up and will present a good challenge for Carla Bremaud and perhaps Cesaria if she is playing by then. Missouri State did lose the first of their 2 exhibition games on Monday but it was to defending D-II national champion Central Missouri 64-70. I doubt the Shockers would have won last night if Central Missouri had been the opponent. Sam Houston State on Wednesday, November 14th, at 6:30 pm was 2-23 last year with an RPI of 336. They are picked to finish 13th (last) in the Southland Conference this year. Houston Bapitist on Saturday, November 17th at 2:00 pm was 6-18 last year with all 6 wins in the Southland Conference. They had an RPI of 310 last year and are picked to finish 10th in the Southalnd this year. So in a way this early schedule is essentially an extended exhibition schedule that counts towards your record. Normally I would hate this schedule but while this schedule won't prepare the team very well for what comes later it does perhaps provide the best platform for developing this very young team early on. I'm thinking MIssouri Staste will be a loss but I hope the Shocks have enough talent to overcome their lack of experience against the other 3 bottom of the barrel teams. If that doesn't happen it will signal a long, long, long way to go for the Shocker program. Last edited by 1972Shocker; November 9th, 2018, 01:00 PM. Will it work? I probably wouldn't bet on it but we will see. Outside of men's basketball student interest and commitment to Shocker sports is very minimal. I don't see this promotion changing that much but it is a good try. We did have a niice tournout at the opening home volleyball match this year but that has not be sustained to any significiant degree. Maybe if we had a volleyball team and/or basketball team that perennially competed for national championships we might kill it at the box office but those programs are very few and far between. I think if the women's basketball program could apporoach 1,500 in actual attendance (not tickets sold but butts in the seats) consistently that would be a big win for that program. Maybe we will see that at some point in the next few years. I hope so. That can happen if the product the Shockers put on the floor improves enough and if they can upgrade the quality of the home scheudule.. Sounds like Cesaria is still out of commission (back injury I believe -- no idea what her prognosis is). Cesaria and freshman Dawnyel Lair were the only 2 players not to play in the exhibition game. Not sure what the story is on Dawnyel. HCKA did talk about her on her radio show last night. Said she was very athletic (can grab the rim at 5-8) and is very fast. Did not say anything about why she didn't play in the exhibition game. I am not even sure Dawnyel was on the bench. Shouldn't need them against Arkansas-Pine Bluff but Cesaria would have been very useful against Missouri State. So the Shocks enter the season with only 2 players on their roster that have played in a D-1 game. HCKA wants Sabrina to be more assertive on offense this year and not defer as much as she has in the past. Sabrina showed her versatility – and her importance – in a game-turning sequence during the exhibition win. She scored six straight points, grabbed an offensive rebound that led to a three-pointer and grabbed a steal during a 9-0 run that put the Shockers in a control in the second quarter. 4 minutes in and the Shocks are up 12-0 and looking good doing it. 24-4 at the end of Q1. 39-14 at the half. Sabrina with 19 on 8-10 shooting including 2-2 on 3 pointers. Shocker dance team. Really nice and so was the dancing. 56-26 at end of Q3. Last edited by 1972Shocker; November 7th, 2018, 08:29 PM. Okay, well 1st of all it was Arkansas - Pine Bluff. APB had some good size in the post, pretty good athleticism and a few good players. Not the greatest set of basketball skills overall though. That said I thought this was a pretty impressive performance by this very young Shocker team and a very nice improvement over their exhibition game. The starters (Sabrina, Seraphine, Shyia, Carla and Maya -- a senior, a juco transfer and 3 frosh) were particular impressive opening the game with a 20-4 run over the first 6 minutes before HCKA made her first subs. The Shockers appeared to lose a bit of their edge in the 2nd half after taking a 39-14 lead at halftime. Part of that was HCKA subbing liberally and trying a lot of different combinations and part is the natural let up after building such a commanding lead. I did think the Shocks got a bit sloppy and selfish with the group of reserves that took over with about 7:00 minutes remaining in the game. Arkansas - Pine Bluff put on a press which did seem to bother this group plus there was too much hunting for shots and points and not enough running the offense. But again that often happens in games like this. Sabrina, the Shockers only available senior as Cesaria still is in street clothes due to a back injury, was outstanding tonight. She was very efficient offensively scoring a career high 21 points on 13 shots in 17 minutes of play. She played very good defense and hit the boards hard. Probably the best outing of her Shocker career. Seraphine (Phi-Phi) Bastin, the freshman from Belgium, continue to impress with her point guard play doling out 6 assists and showing a lot of savvy in 23 minutes of play. Carla, Maya and and Shyia were also very solid in their starting roles. Carla is very savvy and Maya and Shyia are quite athletic. What I like most about this starting group was their willingness to share the ball, move the ball, run the offense, defend and rebound. Freshman Jada Peacock had a very good game coming off the bench as she was the Shockers 2nd leading scorer with 11 points on 4-5 FG's including 3-4 on 3 point attempts which was a bit unexpected but a real positive. Sophomore Alyssia Faye did not score a lot but grabbed 8 rebounds to match teammate Shyia Smith for game high honors. Alyssia looks much more comfortable and aggressive this year compared to her freshman year. As a team the Shocks shot 43.5% from the field and were 7-15 (46.7%) on 3 pointers. The Shocks made 15-23 FT's for 65.2% but that was pulled down by some late misses from the deep reserves. Trajata, Raven and Dawnyel were 2-7 from the line in the 4th quarter. The Shocks dominated the boards out-rebounding APB 42-17. Perhaps the main blemish for the Shocks was 20 turnovers but they only had 7 in the 1st half and as I said things definitely were a bit sloppier for the Shocks in the 2nd half. We should get a much better measure of where this young team is on Saturday against Missouri State at Koch Arena but this was a good start for this team and you can certainly see the potential in this group of players. Last edited by 1972Shocker; November 7th, 2018, 11:18 PM. Last edited by 1972Shocker; November 7th, 2018, 11:33 PM. Great start for the women. Jaida had a rough night shooting (and took a lot of shots) and Dawnyel was only 1-4 from the line. Take those shooting numbers out and the gals were .500 FG%, .600 from 3, and .736 FT. 11 players saw double digit minutes with no one over 23. Also only 5 APB players of the 13 who played found the scoring column. All 12 Shockers who played did score. I probably should have mentioned for others than Sabrina's team leading 21 points, 6 rebounds, 2 steals, and a block didn't come by her leading the team with 23 minutes. She was tied for 6th in minutes with Ashley at 17 and 1 minute ahead of Jaida. Jaida, the regning Miss Basketball in Michigan, is no doubt used to being the go to player and cutting it loose. HCKA says she is one of the better passers on the team. I think Jaida will be fine but the game may be moving just a little bit too fast for her right now. She probably should focus on defense, rebounding and finding open teammates and letting the game come to her on offense. Dawnyel is a bit of a wild filly that needs some taming. Plenty athletic though. The spin move she made to score on a fast break late was impressive although probably should not have even been tried as it was 1 on 3. Dawnyel also had 3 turnovers in only 7 minutes of playing time. Her free throws looked pretty flat. 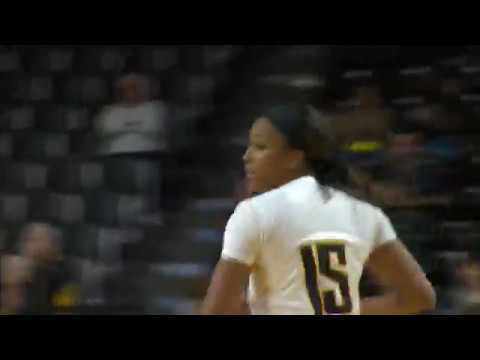 This was my first time seeing Dawnyel as she did not playin the exhibition game nor at Shocker Madness. So hard to come to any firm conclusions on the basis of 7 minutes of play. I thought HCKA might redshirt a couple of the 9 frosh. That isn't going to happen as the only players who did not see action were Sr. Cesaria Ambrosio (in street clothes), R-Fr. Asia Henderson and Fr. Natalia Ryng. Perhaps Natalia will redshirt although I am not sure what her potential is. Not sure why Asia did not play in a 37 point blowout. She also only played 3 minutes in the exhibition game. I guess she is still in project mode. Not sure what Cesaria's prognosis is. HCKA may need to shorten her bench a little against Missouri State but she should have plenty of opportunities to go deep against Sam Houston State and Houston Baptist. Last edited by 1972Shocker; November 8th, 2018, 01:14 PM. Sabrina was really good against APB but the player I am really starting to like a lot is Freshman point guard Seraphine Bastin out of Belgium. Very small sample size at this point but from what I have seen of her she seems to really get it. She wasn't perfect against APB but she is far better than I was anticipating this early in her career. I don't know if she will be a big scorer but she looks like a natural as a floor general and she does a good job of penetrating and either scoring or dishing of to a teammate. It was interesting at the end of the game when the Shockers got the ball with 9 seconds left and Seraphine took a pull up jumper from the free throw line at the buzzer. The first thing HCKA did at that point was not to greet the APB coach but to walk directly to Seraphine and in a very motherly fashion and without embarrassing her told her taking the shot up by 37 was not the thing to do. Not sure what communication had been made when the Shocks got the ball with 9 seconds left but obviously Seraphine did not get the memo. She missed the shot and it was not really a big deal but I liked the way HCKA handled it. And I'm sure the APB coach noticed that as well. Could she join the men’s team by tomorrow? 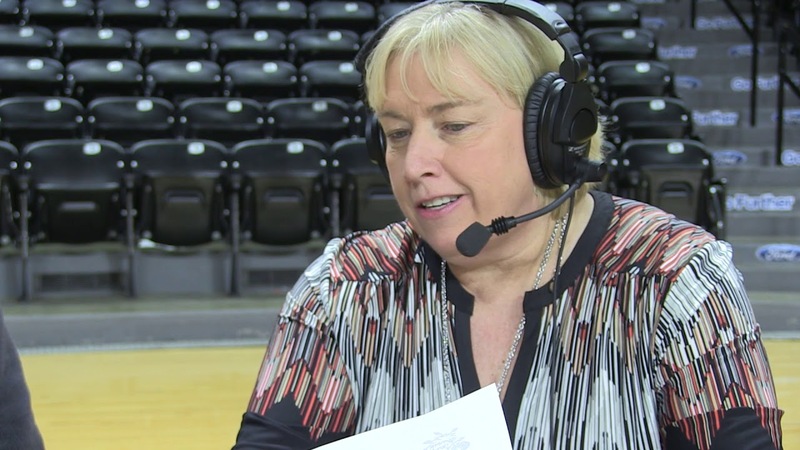 So the Lady Shocks had a somehwat halting performance in their exhibition game against D-II Missouri Southern followed by a generally very good performance against Arkansas-Pine Bluff, a very weak D-1 opponent. Not sure which of these two teams were the better team. The Shocks will have an opportunity to validate their UAPB performance on Saturday against former MVC rival Missouri State. MIssouri State also has a relatively young team this year as I mentioned in my thread opening post above but still are not nearly as young and inexperienced as this Shocker team. Missouri State on Saturday, November 10th, at 2:00 pm would normally be a challenging opponent but they are somewhat in the same shape as the Shocks in terms of yourth and inexperience. The have only 1 senior and 2 juniors on their roster with 6 sophomores and 5 freshman. So they aren't quite as young as the Shocks but they are pretty young. 6-2 Jr. guard Alexa Willard is a very good player and a tough match up and will present a good challenge for Carla Bremaud and perhaps Cesaria if she is playing by then. Missouri State did lose the first of their 2 exhibition games on Monday but it was to defending D-II national champion Central Missouri 64-70, Central Missouri is picked to finish 1st in the MIAA. The Shocker exhibition opponent who they defeateds 62-49 is picked to finsih 10th in the 14 team MIAA this year. In it's second exhibition game MSU blew out Lincoln University 100-54. Lincoln is the unaimous pick to finish last in the MIAA. 5-10 guard Danielle Gitzen is the only Lady Bears senior. She has good experience and average 8.9 points, 4.4 rebounds and 1.9 steals per game last year and was selectyed to the MVC All-Defensive team. 6-2 Jr guard Alexa Willard was on the MVC All-Freshman team and was First Team All-MVC last year. She is a tough match up with her height. Our best match up with Willard is probably 6-0 Sr. Cesaria Ambrosio but she is injured and I don't expect her to play against the Bears. The Shockers have a few other options to match up with Willard but none that have more than the 2 games this year of D-1 experience. This would include 5-11 Fr. Guard Carla Bremaud, 5-11 Fr. Guard Jaida Hamption and maybe 5-11 Fr. Forward Shyia Smith and 6-1 Jr. Forward Raven Prince. 5-8 So. Guard Bruce Calip averaged 7.2 PPG, 4.2 RPG, 2.6 APG and 1.7 TOPG in 26.2 MPG. 6-1 Jr. Forward Shameka Ealy and 3 other Sophomores played between 10 and 14 minutes per game and averaged 3.2 to 3.5 points per game as freshmen. All-in-all, excluding 2 little used end of the bench freshman, MSU has a combined 11 years of D-1 experience. The Shockers, excluding the injured Cesaria, have 4 years of D-1 experience. MSU was 21-12 last year and finished 2nd in the MVC at 15-3 behind undefeated Drake. Looks to me like the Shockers have to be considered the underdog in this game but I do think they are capable of pulling off an upset. Salute to Service - FREE admission for all service men and women in uniform or with military ID. It would be nice to see a good crowd of 1,200 or so out to support this young Shocker team but I'm not really expecting it. Announced attendance against UAPB was 1,427 but I don't think there were much more than 500 in actual attendance, if that. Not sure who is buying the 1,000 or so season tickets that seem to go unused but this is nothing new. Whoever has those how about donating them to Big Brothers-Big Sisters or Boy's and Girl's Clubs if they aren't going to be used.